Update: Now the rest of the world can enjoy (or try to break) their own shatterproof Motorola phone. The company has announced the Moto X Force, which also features a ShatterShield display. Have fun not ruining your phone screens, new Moto owners. Motorola finally solved a major problem of smartphone ownership with its latest Droid device. 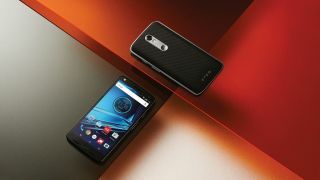 The new Droid Turbo 2's most noteworthy feature is its quasi-alliteratively named Moto ShatterShield display technology, which Motorola says makes it the first smartphone with a shatterproof display. ShatterShield is made of five layers of impact-absorbent material, and Motorola claims the layers on the 5.4-inch Quad HD screen "are proven not to crack or shatter." The new display tech is an impressive development, though not a perfect one. For now, the Droid Turbo 2 is exclusive to US carrier Verizon. The carrier is offering a four-year warranty on the display and the phone's embedded camera lens, though scratches and other kinds of damage to the lens aren't covered by the warranty. Customers are also warned that the Turbo 2 isn't shockproof nor built to withstand all damage from dropping. There is hope though that ShatterShield will make it to other Motorola devices down the line (update: it already has with the new Moto X Force). Rick Osterloh, Motorola's president, told CNET that ShatterShield is expected to be included on future Moto products, though because of the price related to the tech, only higher-end, flagship phones will have shatterproof displays. Look for another smartphone outfitted with a shatterproof screen sometime next year, Osterloh teased. The Droid Turbo 2 and the Droid Maxx 2, another newly announced phone that is essentially the US version of the Moto X Play, arrive at Verizon on October 29. The Droid Turbo 2 will cost $26/month for 24 months or $30/month for 24 months if customers decide to give it a one-time design refresh. The Maxx 2 runs $16/month for 24 months.